I recommend the following species below for the beginner enthusiast, or as a pet arachnid that will allow you to gain experience. Most of the tarantulas that I selected here are opportunistic burrowers/terrestrial. All of these listed tarantulas I own, and have raised from spiderlings or juveniles unto matured adults. The main reasons I have chosen these tarantulas are, for their meekness, and visibility. You will be able to see your tarantula molt, eat and learn its behavior. As a novice, it is imperative that you learn each species behavior that you own. An opportunistic burrower/terrestrial tarantula should be provided with a hide if necessary. Most terrestrials will burrow as spiderling if given the proper depth of substrate, but once they reaches juvenile or adulthood, they tend not to burrow, and are almost always visible. Because of the hardiness of these tarantulas, it also gives the learner the grace to make mistakes without dire consequences. An apprentice should not purchase a expensive tarantula from the start. Remember, the least available a tarantula is in the market and the harder it is to breed, the more it will cost; but with time that $1000.00 tarantula, I bought for 79.00. I have seen a species that cost 500.00 when it first hit the market and eighteen months later it was selling for 69.00 (supply and demand). You will find that one of the greatest virtue in this hobby is discipline. THIS HOBBY IS ADDICTING. You will always see another tarantula you want to buy and add to your collection. 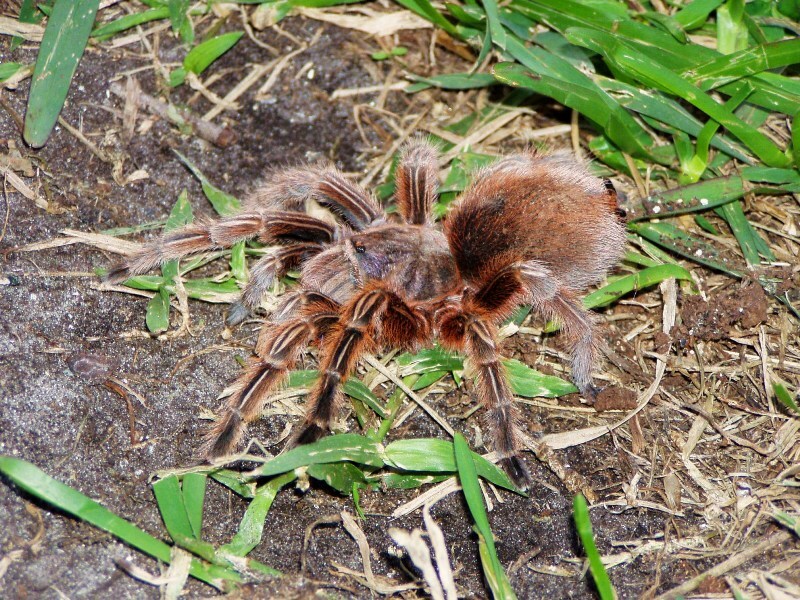 1) Chilean Rose Hair (Grammostola rosea) (red colored morph) probably the most commonly imported tarantula in the trade. It is a scrubland/savannah species that is hardy, and fairly docile. This is a slow growing species. They are opportunistic burrowers. I have found that the common brownish morph is more pet friendly than the red phase, which is more skittish. Yet both are good starter T's. 2) Curly Hair (Brachypelma albopilosum) - The Curly Hair is a rain forest species and is an opportunistic burrower from Central America. It is hailed from Nicaragua and Honduras. They are brown to bronze with long, curly hairs. This tarantula is medium built with a stout body. This species is very docile, and my girls have never kicked hair at me, which make it an excellent beginner tarantula. 3) Mexican Redknee (Brachypelma smithi) - This is the classic tarantula of the hobby, and probably the most popular. It is desert/scrubland species that grows to about 6" easily. I have a girl that I raised from 1/4" to about seven inches. She is over eleven (11) years old. It is said that the longevity of this species is 25 years (+) with females. This is a very colorful tarantula with red, yellow, orange and cream bands on black legs. I have never seen one of mine assume a threat pose, but sometimes they will kick their urticating hairs, which are very irritating. Yet no collection is complete without one. They are opportunistic burrowers. 4) Chaco Golden Striped Knee (Grammostola pulchripes) - This gentle giant species is from the savannah habitats of the Chaco region of Paraguay. It is extremely docile, and grows to a length of 7"+ leg span. It is charcoal colored with mustard striping on the legs. They are reluctant to bite or kick urticating hairs. They are also opportunistic burrowers; but once they reach about four (4) inches, they stay outside their hide, which makes it a good display tarantula with a subtle beauty, especially in natural sunlight. After reaching 4" they become very slow growers. The first two year years of growing, a 1/2" spiderling may reach four (4) inches in leg length. Afterwards, it took my girl five (5) years to attain three (3) more inches. She is now at a robust seven inches (7"). It is worth the wait. When I go to schools for educational workshops on tarantula, I always take my Chaco with me for display and because of their docility. 5) Pink Zebra Beauty (Eupalaestrus campestratus) - Another species imported from Paraguay. It looks similar to the Aphonopelma seemani, but they have pinkish, hairs on their legs, underside and on the abdomen. They are savannah species, hardy and are very docile. This is definitely a pet rock and the most passive tarantula I have in my collection. I don't particularly recommend handling tarantulas, but if you want a tarantula that you can pick up, this is the one. They are slow growing and are opportunistic burrowers. 6) Antilles Pinktoe (Avicularia versicolor) Most species of the Genus Avicularia will make a good beginner arboreal tarantula. This medium size, colorful, and docile species is a classic of the hobby for an arboreal. They are a bright florescent blue as spiderlings. But once matured they become a rainbow of colors. The carapace is a nice olive-green iridescence; the abdomen is reddish-blue. They are a rainforest species, which will require a vertical tank with cork bark slabs and slightly moist peat moss/vermiculite substrate. They can become fast and jumpy as spiderlings and juveniles, but are disinclined to bite. 7) Brazilian Black (Grammostola pulchra) - This is an impressive robust, savannah and forest dwelling species. This beautiful tarantula is velvet black. It is said that females can achieve a 7" leg spans. My girls are ten (10) years old and are only seven (7) inches plus. This species is reported to be a slow grower. My girls reached the five (5) inch mark in three years. It has a very calm, forgiving nature. My girls have never kicked urticating hairs at me. The Brazilian Black is opportunistic burrowers. 8.) Costa Rican Zebra "Striped Knee" (Aphonopelma semmanni) - Imported from Central America - (Costa Rica, Honduras, Nicaragua, El Salvador) I chose this specie as a beginner tarantula because it will give the novice an opportunity to learn the behavior of a species that is not as docile but more skittish. It sometimes will pose a threat but is reluctant to bite. A beautiful tarantula from the tropic that is black with cream stripping on the legs when freshly molted. In the last ten years, tarantulas are being imported as A. semmanni that has a bluish tint. I am not a taxonomist but there was a time when this color morph was not in the hobby. Now the black and cream is hard to find.